*Adrenaline autoinjectors (AAI) are prescribed to those at risk of a severe allergic reactions (anaphylaxis). You should administer the person’s own AAI if readily available. Some schools which hold a “spare” AAI device which can be used if available, but only where the school has permission to do so. Do not require urgent medical attention. Usually get better, but can worsen and turn into anaphylaxis: so watch out for anyone having a mild-moderate (non-anaphylaxis) reaction as this could get worse. 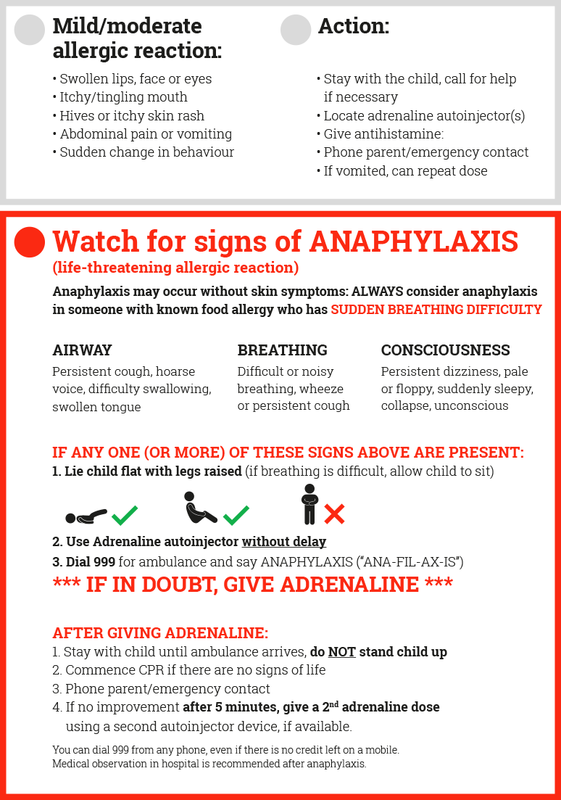 Anaphylaxis usually occurs together with more mild symptoms of an allergic reaction (such as an itchy mouth or skin rash), but can happen on its own without any mild signs being present. Always use adrenaline FIRST (before other medicines such as inhalers) in someone with known food allergy who has sudden-onset breathing difficulties – even if there are no skin symptoms. Do NOT move the person. Standing someone up with anaphylaxis can trigger cardiac arrest. Bring the AAI to the person having the reaction, not the other way round. Lie the person down with their legs raised. If breathing is difficult, allow the person to sit. If the reaction isn’t better after 5 to 10 minutes, then give a second dose of adrenaline: use another AAI device, as the AAI can only be used once.